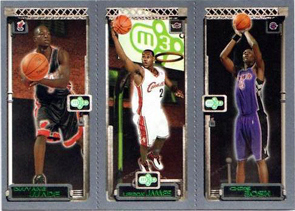 2003-04 Topps Matrix was interesting, but ultimately unsuccessful at the time of it's release. The 220-card base set offered rookies, the catch was that every rookie was paired with 2 other fellow rookies, forming 110 different "Matrix Trilogies". There are few other basketball card hobby boxes that hold the quality and quantity of the rookie found in Topps Matrix. Apparently when you throw 110 darts at a board, you're gonna hit the bull's eye with one of them. In the case of Topps Matrix, the bull's eye appears to be a triple "true rookie" featuring the south beach trio of Dwyane Wade, LeBron James, and Chris Bosh. Previously, the LeBron, Carmelo, Wade trio was thought to be the only card with long-term hobby potential. Below we look at the top 10 trios from the 7-year old basketball product and attempt to explain Topps Matrix Basketball through "The Matrix Trilogy" movie series. 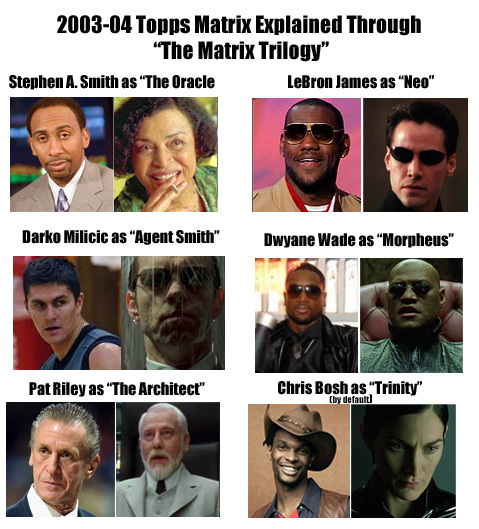 *By default Chris Bosh is Trinity due to the fact that Trinity is part of The Matrix's "big 3"
hahaha that matrix thing is hilarious. Now I’m waiting on someone to do a youtube parody that would be great. I just wish I had really got back into collecting when these came out because I would have stock piled them. Unfortunately I took about a 5 year hiatus while I was in jr. high and high school haha. Oh well I’m back now and have been for a while. does anyone know about the 1 of 1 five card set of these matrix cards?